You look into the mirror one day and notice that something dark has appeared on your teeth. You rub at it, but it won’t go away. You even try brushing your teeth again, but the stain remains. This is where teeth whitening steps in to restore your smile. Teeth whitening is a cosmetic dental treatment in which special whitening gel is applied to teeth. This bleaching gel lightens stains and discoloration, leaving teeth bright and brilliant. Depending on the depth of staining as well as your desired shade of whiteness, it may take several rounds of treatment in order to achieve your ideal look. Dr. Diane W. Sherman offers the comfort and convenience of take-home teeth whitening trays. During your consultation appointment, we’ll determine whether teeth whitening is the appropriate treatment for your smile and then take impressions of your teeth to create a mold of your smile. These 3D models are then sent to a trusted local lab, where whitening trays will be created for your treatment. After the whitening trays are made, you’ll return to our office to have the trays checked for fit. Our Encinitas cosmetic dentist will then provide you with instruction on their use and show you how to fill the trays with the professional grade whitening material. We’ll also answer any questions you may have about the teeth whitening process and give you instructions on how long treatment should last. Depending on your ultimate end goals, Dr. Sherman may recommend wearing the trays for anywhere from one hour to overnight. When you remove the tray, you simply wash it off and put aside until the next whitening session. You will repeat this process until you reach your desired shade, but it’s vital that you follow all of Dr. Sherman’s instructions. Yes. When done properly, the teeth whitening process is completely safe. A common side effect of teeth whitening among patients is dental sensitivity, but this can easily be remedied by switching to toothpaste for sensitive teeth. If your gums become irritated due to teeth whitening, be sure to come talk to us about how to more effectively apply the whitening solution to your tray. Teeth stains occur in a myriad of ways, but there are two main types of staining: extrinsic and intrinsic. Now, these substances don’t automatically cause stains. But if you tend to indulge in these foods and products on a daily basis and don’t keep up with oral care, the stains will appear. Physical trauma to the tooth. Dentinogenesis imperfecta (a condition that a patient must be born with). Aside from the causes listed above, stains can also occur from aging, health reasons, or due to genetics. The best way to avoid stains like dark spots or yellowing is to be aware of what you’re putting in your mouth. Whether it’s a third cup of coffee or a cigarette, be conscious of your vices and keep them in moderation. Maintain vigilant oral care at home by brushing and flossing at least twice a day, and make regular dental appointments with our dentist in Encinitas. We also recommend sugar-free gum with xylitol to chew after a meal. While xylitol can’t prevent stains, it can prevent plaque from sticking to the surface of your teeth. Plaque is bacterial waste that causes tooth decay, another common cause of stains. Contact Dr. Sherman for More! You don’t need to go through life with ugly stains and yellowed teeth. Take a look at teeth whitening with Dr. Diane W. Sherman, and see how we can guide you towards a brighter, whiter smile. 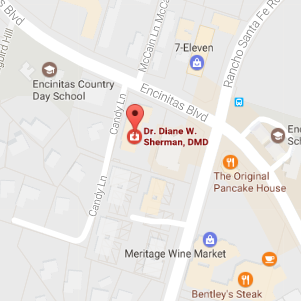 Contact us today to schedule a consultation at our Encinitas, CA office.